Are you looking for a great, tasty soup recipe that the kids will love? Something good year round? 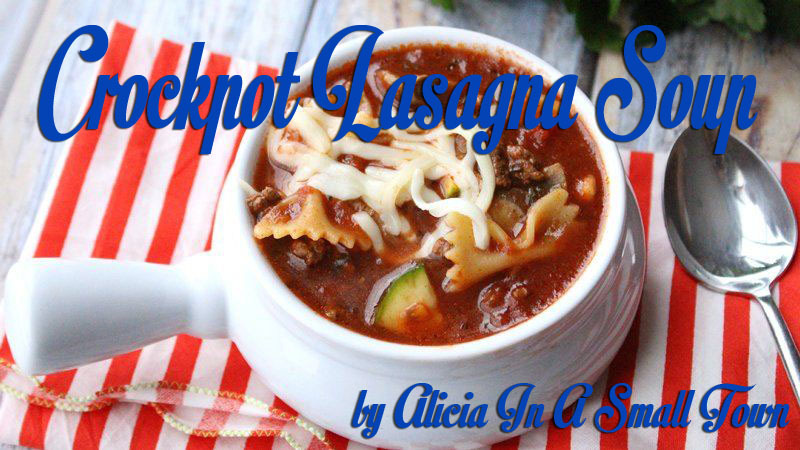 Look no further than this fabulous Crockpot Lasagna Soup! I think you are really going to love this soup, I know that my family does. We always make sure to squeeze it into our meal plan at least once a month! Without further ado, here is our Crockpot Lasagna Soup recipe! In 10-inch skillet, cook beef and onion over medium-high heat, stirring frequently, until beef is brown; drain. Place in 6-quart slow cooker. Add garlic, tomatoes, tomato sauce, broth, mushrooms, basil, parsley, water, salt and pepper to slow cooker; stir. Cover and cook on Low heat setting 7 to 8 hours. When about 30 minutes are left , add uncooked pasta and zucchini; cover and continue cooking until time is up. Did you try Crockpot Lasagna Soup? If you tried this recipe, please leave a comment below letting me know if you loved it, liked it, or hated it, and any changes you would make! I love the rock pot dishes. It’s so easy.